In Italian life, the world revolves around the family and the table. Perhaps this is why more people in the USA are seeking to establish Italian traditions in their own homes. It is common in Italy for the family to work collectively on the meal preparation. Whether making tortellini or ravioli, removing the leaves off the herbs, grating the cheeses, or shelling the shrimp, etc…the family often gathers around the table and socializes while completing these labors of love. Today, it is my privilege to introduce you to a new chef in my kitchen. 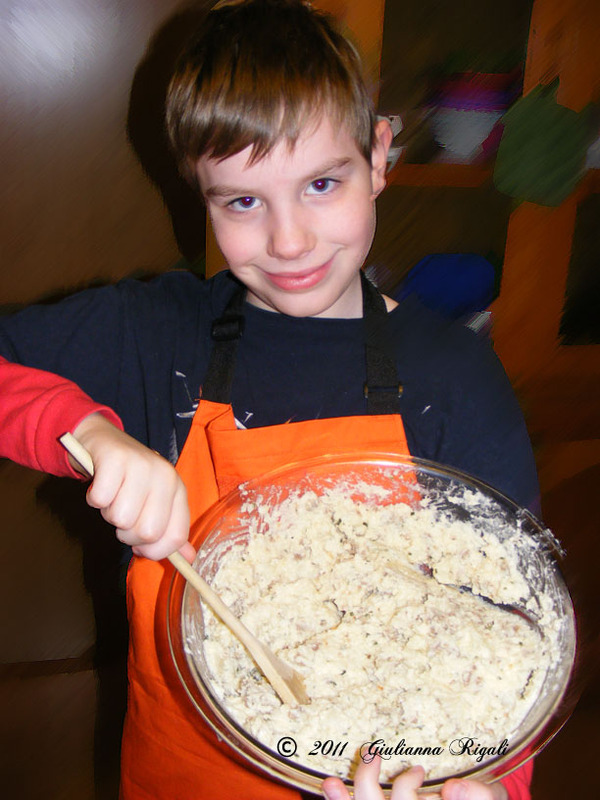 Chef Bretto, while only 9 years old, brings more knowledge of cooking to the kitchen than I did when first married (and I knew how to make homemade candy and pies already, but not much about cooking main dishes). 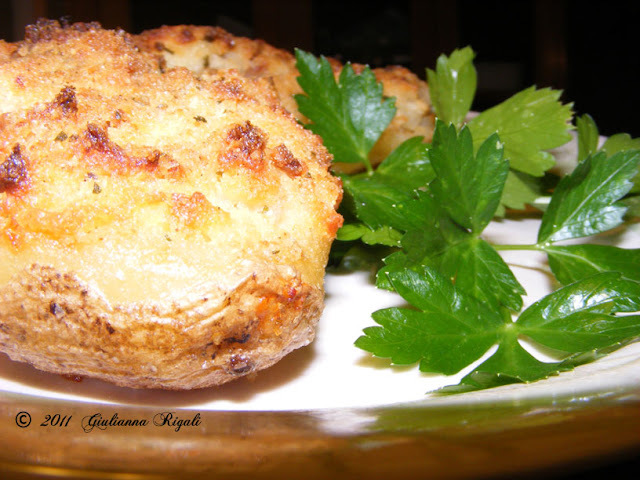 Barche (Sausage Potato Boats) Recipe. 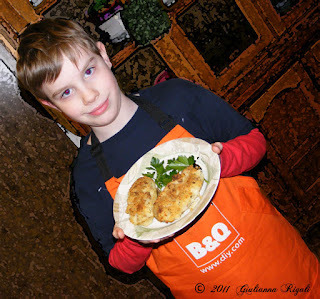 Chef Bretto started watching “foodie” shows when he was young and I sheepishly confess, it was NOT with me, but rather with his older sister and his nonna (grandma). He developed this passion apart from me. He was crushing on Rachel Ray before I knew she existed. He would ask me why I did not use certain herbs or why I do not make particular dishes for our dinner. Brett inspired me to gain knowledge of cooking and venture out of my comfort zone to try new dishes. This week, I developed a new family friendly Italian recipe, as is often my goal, since I have small children as well as grown children in my household. Chef Bretto insisted on being the culinary hand that put this masterpiece together. It went over huge; every kid in our family went back for seconds. I consented for Chef Bretto to name it since he took the honor of composing our scrumptious meal. He has thus christened it, “Salsiccia di patate Barche” or “Sausage Potato Boats.” Hope you enjoy it as much as we did! Prepare a baking pan (such as a jellyroll pan 11X17 pan with a lip) with a sheet of baking paper or foil. Scrub the skins of the potatoes clean and then pat dry. Oil the outside of each with olive oil and then rub some sea salt on them and place on the pan. Put in the oven and cook for 1 hour. The oil and salt make for a DELICIOUS skin on the outside of the potato. Add the Italian Sausage to the skillet and mix it in with the onion and garlic mixture. Cook until Italian Sausage is no longer pink or lightly browned. 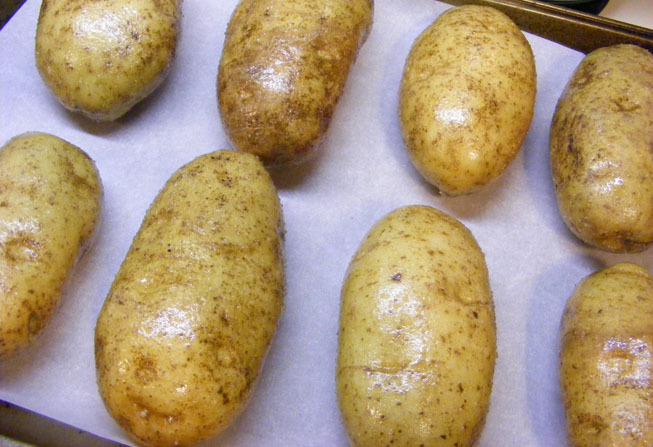 Check to see if your potatoes are finished when baked for one hour by piercing with a knife to see if they are tender. Sit them aside to cool for about 10 minutes before proceeding. Take 1 cup of heavy cream and place it in the large mixing bowl. Add one tablespoon of Balsamic Vinegar to it. Remember, if you don’t want to take this step, you can just use sour cream in place of the heavy cream and vinegar. After about 5-10 minutes, stir in the chives and sit aside. When potatoes are cool enough to handle, slice lengthwise in half. Scoop out the softened potato out of the center of each and place into a large mixing bowl with the cream mixture in it, but be sure to leave a thin lining of potato on the skins (if you remove too much potato…the skins will tear or collapse). Leave the potato boats on the baking pan. Mash the potatoes (we use a hand masher to leave them a little chunky). Add the butter and milk. Stir in the parsley, basil, white pepper, and cheese. Pour the contents of the skillet into the potato mixture and finish combining. Spoon the potato mixture back into the potato skins. Use it all, it is okay to mound it up on top. 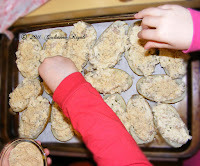 Sprinkle the tops of the potato boats with the breadcrumbs and then drizzle butter over the breadcrumbs. Place in the oven and cook for about 30 more minutes at 350 degrees. Serve hot with a side of salad or a green vegetable.